Over the last year, the leading news story in health care has been the opioid epidemic. 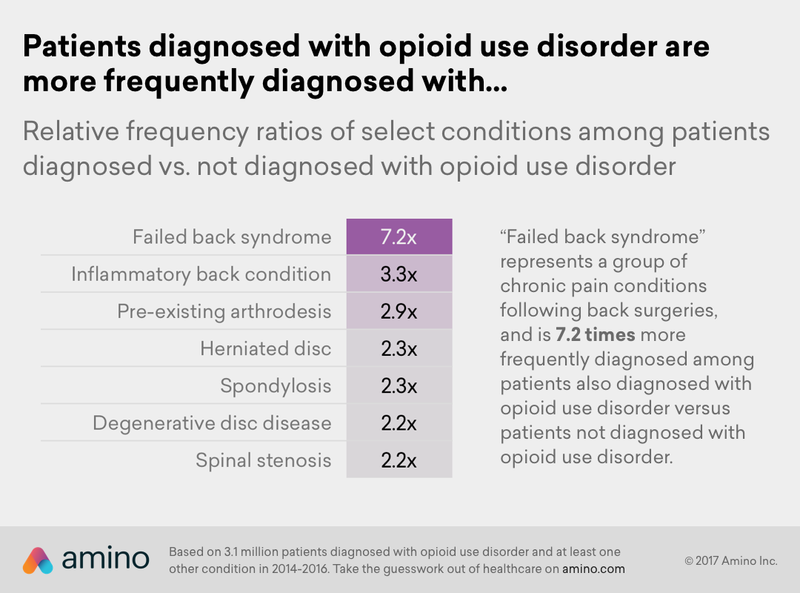 And chronic pain, particularly chronic back pain, has been at the top of the list of reasons why people use opioids long term. Chronic pain is pain that lasts longer than 12 weeks, and for many, it’s pain that can last the rest of their lives. Chronic pain can happen because of a genetic problem or disorder or an injury or accident. Many people who survive serious car accidents or workplace accidents deal with chronic pain for the rest of their lives. Having back surgery increases your chances of relying on opioids to manage pain by over 7 times! Other back problems raise your chances by over 2 times. Obviously, these are also people who are likely to get long-term opioid prescriptions from their doctors. For decades, the standard for doctors has been to treat this kind of ongoing pain with opioids. Now, with opioid drug overdoses skyrocketing, doctors are making changes. Early estimates show that opioids took 53,000 American lives in 2016, more than those killed in car accidents. Opioids don’t just turn off your pain receptors. They also let your brain release more dopamine, which can help relieve stress and anxiety and make you happier. But when you take an opioid permanently, you can build a tolerance to it, which means you need more and more to manage your pain and to feel good. Both the pain relief for chronic sufferers and the way it makes you feel can become addictive. Not to mention, opioids can change how often certain neurons in your brain fire, which means that when you’re not on opioids, you actually get more anxious and unhappy until you take more, causing serious withdrawals. The Centers for Disease Control and Prevention (CDC) has revised their guidelines to help doctors try other treatments first, and doctors are hard at work to find new ways to treat pain. So why is this part of my healthy journey? I have my own chronic back pain. I’m lucky. I’ve never taken opioids for my back pain, so I’ve avoided those issues, but I do understand what it’s like to live with pain as a part of your daily life and why people would be willing to take opioids to stop it. My father has had a slipped disc in his back my entire life. I’ve always known what back pain looks like. I also always thought it might happen to me. Not only can these issues be hereditary, but I also take after my father physically. Combine that with the slouch of someone who hated always being the tallest in her class as a child and now sits in front of a computer all day, and I always suspected that back problems were coming for me. The pain started for me in college, when I was no longer playing sports or working out in P.E. every day. One year, I chose to live in the loop in Chicago instead of by my campus, so as part of my daily commute, I walked about an hour and a half. That was when I really started to throw out my back once in a while. But it wasn’t until I worked at Starbucks after college that I really started to have serious problems regularly. Being on my feet all day and bending up and down with milk jugs all the time really started to take a toll on my back. I’ll get building back pain on one side of my lower back. It can switch sides, and one side is usually worse than the other. And when it fully goes out, my knee on that side can sometimes buckle, which if I’m not ready for it, can actually knock me down. And sometimes it’s so bad that getting out of bed, getting up and down, or just falling asleep, is a challenge. I’ve always known this pain might hit me one day, and when it started, I talked to my dad a lot about what was going on. My symptoms match his exactly. Since I knew what the issue was from my father’s medical history, I wasn’t really worried about getting an official diagnosis. I also already knew that I didn’t want to take opioids or painkillers long term. I’m one of those people who rarely takes even Tylenol. And when I had serious opioids after I had my wisdom teeth removed, they made me feel disoriented and nauseous. My older brother had a serious workplace injury when I was in high school. He broke his pelvis and some of his spine. He’d seen a chiropractor, among many other specialists, when he was recovering, and he still sees one sometimes to cope with his own chronic pain. I decided to explore that as a treatment option instead. My new chiropractor ran some X-rays and told me that my pelvis is tilted, which lets my disc slip back and forth instead of holding it in place. Through a series of adjustments, he worked to bring my pelvis back in line, and brought me some real relief. Unfortunately, I’ve done some state-hopping since then, and while I’m still in better shape than I used to be, I haven’t had time to find a new chiropractor yet. So what can you do to tackle your chronic pain? First and foremost, go see your doctor, especially if you’ve been injured or don’t have a family history of back issues. You might need surgery or other serious help. Consider your treatment options. Surgery can be an option for many chronic back problems, but it has costs. It’s expensive and can cause its own set of pain problems. Opioids are highly addictive. Talk to your doctor about other options, like chiropractic treatment or acupuncture. Talk to your insurance company. Insurance companies want to stop the opioid epidemic too, and more plans are covering alternative therapies like chiropractic visits than ever before. Talk to your employer. If you have insurance through your employer, talk to them about making sure other therapies are covered on your group plan. Work with your care team on a treatment plan to cope with and manage your pain. So how do I manage my chronic back pain without drugs? Set expectations. Knowing I would probably grow up to develop chronic back pain means I’ve always been ready for it. Accepting that pain will be a part of my life helps me feel in control. Find a treatment that helps. For me, this has been regular chiropractic adjustments that help relieve tension and keep my disc in place. Get massages. I get the occasional massage to help relieve tension in the muscles in my back too. Many people with back pain get regular massages and swear by them. Exercise and eat right. Even just a few extra pounds can put enormous stress on your spine if you already have back problems. And exercise can strengthen the muscles in your back. Focus on low-impact activities and strengthen your core if you’re already in pain. And choose your cardio wisely. Running outdoors or on inclines can be really hard on your back and pelvis. Try running on a treadmill, walking, or biking instead. Try yoga, pilates, or tai chi. Yes, these are technically forms of exercise, but they’re more than that too. A new study found that yoga can actually help relieve back pain itself, but recommends gentle poses. And the routine they used is free online. I find it highly relaxing and a nice way to stretch and wind down, and you can do it as often as you want. Get plenty of sleep. You’d be surprised how sleep affects other parts of your life. When I’m sleep deprived, my back is much more likely to go out. And since I struggle to sleep once my back’s out, it makes for a long sleepless week in that situation. Try little treatments and tricks. I ice my back and use heating pads. I also take over-the-counter pain meds before bed if my back feels like it will go out during the night. If my back’s already out, lying on the floor (if I have someone handy to help me get up later) can help. Putting a pillow between my knees can also help while I’m trying to fall asleep. Meditate. Meditation can help you clear your mind and refocus, and mindfulness can be surprisingly helpful in overcoming pain. There are easy apps you can try to get started too. Talk to someone or journal. Chronic pain can be emotional. You hurt. You can’t escape it, and it can feel hopeless. Talk to a close loved one, journal about what’s happening, or visit a therapist. It can help you blow off steam, lighten your mental load, feel heard, and document your pain’s progression. Practice self-care. Stress and tension can tighten up everything in your back. Find ways to reduce and fight stress in your life. And find little pleasures that you can focus on each day, like your favorite coffee, trading back rubs with your significant other, or cuddling your pet. Most importantly, get help when you need it. Never let your pain push you so far that you can’t handle it or you fall into depression. Talk to your doctor to keep your mind and body healthy, even in the face of chronic pain. Many years ago, I really looked forward to our high school homecoming. Looking back, we were involved in a number of hazardous activities, but at the time, they were the norm. We pressed in around an enormous bonfire with little or no supervision. We rode on the back deck of a convertible, and sometimes the driver would tap on the gas just to give us a thrill. We consumed enormous quantities of high-fat, high-sodium foods – no wait, we did that all year. And to top it off, most of these activities were at school, which could have been full of asbestos. Our hard-charging football team was known for its defensive rushing, and the crack of the helmets could be heard above the roar of the crowd. Traumatic brain injuries can be caused by injuries from all kinds of sports, especially the high-impact ones, like soccer, boxing, football, baseball, lacrosse, skateboarding, and hockey, particularly in youth. Bob Slesinski works in Purchasing at Carle Foundation Hospital. One of his passions for the last 20 years has been coaching high school basketball teams. As usual, the more you learn, the more you know. It was once common not to wear seatbelts, too. It’s hard to believe that was the norm at one time. Prevention is important to maintaining good health, so it is important to know what you need each year at your doctor’s appointment. This should happen at every doctor’s appointment, even if you don’t currently have high blood pressure, to track your levels over time. This yearly shot protects you and those you care about from the flu. Triglycerides Test – This measures the amount of triglycerides, a type of fat your body makes and stores from food, in your blood. This yearly test can detect early signs of kidney damage. You should set up this kind of doctor’s appointment with your dentist every 6 months for a regular cleaning. This yearly doctor’s appointment is when your eye doctor puts eye drops into your pupil so they can get a better view of the back of your eye. This one-time shot prevents blood, brain, and lung infections, like pneumonia, caused by a certain bacteria. Those with diabetes should have this test at doctor’s appointments 2 to 4 times a year to help track their blood sugar levels long-term. This should happen at every doctor’s appointment for those with diabetes. Never be afraid to ask your doctor for advice. They want to help you be your best! Prepare – Organize your questions ahead of time, and feel free to write them down if you’re afraid of forgetting anything. Be Specific – Detailed information can help your doctor make your treatment plan and make sure it is working for you. Tell the Truth – Be honest and direct with your doctor. Sharing information about how you feel will help you stay healthy. What’s my blood pressure, cholesterol, and health goals? How frequently should I check my blood pressure? What lifestyle changes can I make to lower my blood pressure and cholesterol? Should I start a healthy diet or exercise plan? What are the common side effects of my meds? Will any of my other meds, supplements, or foods interact with any of my meds? Do you get nervous or anxious when you go to doctor’s appointments? You’re not alone, and it can actually cause your blood pressure to rise while you’re there. Research shows that about 20% of patients with mild cases of high blood pressure see their blood pressure rise at doctor’s appointments. This is sometimes called white-coat syndrome. Track your blood pressure at home and compare readings with those taken in the office to see if this is happening to you. Take these readings with you to your next doctor’s appointment and talk to them about it to make sure they get an accurate account of your blood pressure. And once they know, your doctor can also help calm your fears, like by explaining exactly what they’re doing as they go.